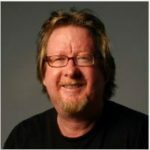 This week we’re talking with author C.F. Yetmen about her new novel, What is Forgiven (Ypsilon & Co. Press, September 5, 2017). C.F. 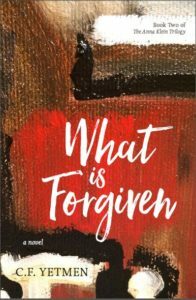 Yetmen’s latest novel, What is Forgiven was released September 5, 2017 by Ypsilon & Co. Press. What is Forgiven is the second novel in her historical mystery series, The Anna Klein Trilogy. Book one of the series, The Roses Underneath, won the IPPY Historical Fiction of the Year Award in 2015, Shelf Unbound’s Best Indie Book of the Year in 2014, and was a finalist for the INDIEFAB Book of the Year. The Anna Klein Trilogy is inspired by the circumstances of the German half of Canan’s family at the end of World War II. Canan’s day job as an architectural writer sparked her interest in the work of the Monuments Men, many of whom were architects. The two ideas collided to create the stories of the Anna Klein Trilogy. Canan holds a B.A. in English from the University of Texas. 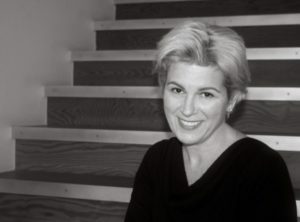 She is the former publisher of Texas Architect Magazine of the Texas Society of Architects. She received the Award for Excellence in the Promotion of Architecture through the Media in Honor of John G. Flowers, Hon. AIA. She lives in Austin with her family. About What is Forgiven (Ypsilon & Co. Press, September 5, 2017). What is Forgiven follows Anna Klein, who has been working with the Monuments Men for a few months and continues to struggle to put her life back together. In this book, she confronts the Holocaust and her complicity, as a German citizen, in the atrocities the Nazis committed. Because the Nazis stole the property of Jewish collectors, the art now under the Americans’ control must be restituted. But she learns that when the stakes are this high, people rationalize their greed and crimes to protect themselves, their reputations, and their loved ones. The book series is inspired by the circumstances of the German half of Yetmen’s family at the end of World War II. Although no one worked with the Monuments Men, her grandmother, who was displaced, along with her great-grandmother and mother—then five years old— was lucky enough to get a job working for the American Occupation Forces. Yetmen’s day job as an architectural writer sparked her interest in the work of the Monuments Men, many of whom were architects. The two ideas collided to create the stories of the Anna Klein Trilogy. The man’s pale face was cracked, the scars of his ordeal revealed under the ribbon of sunlight streaming through the dirty window. Just under his chin, a ridge of pink paint hinted at the jowls that told his age, but the same paint gave a youthful rosiness to his cheek. He looked at Anna with near-black eyes, his expression defiant and expectant, as if they were engaged in conversation and it was her turn to reply. A light warping torqued the canvas in its frame and a small tear was visible at one corner, but it was nothing that wasn’t fixable. Anna lowered her face toward the painting as it rested on the swatch of cloth the conservators used to protect the precious inventory, and when she was sure no one was looking, she ran her hand across the rough paint, feeling its texture on her fingertips. She knew she shouldn’t touch it, even with gloves, but the temptation was too great. The familiar sounds of army boots squeaking on the waxed floors and the low rumble of American voices continued in the near background, and the sun illuminated the dust in the air. She inhaled the distant oily scent and exhaled it for a long time, sending a cloud of tiny particles swirling toward the ceiling. She considered what the Man in a Green Jacket had endured in order to arrive here, into her care. Months in a damp cellar wrapped in bed sheets alongside a few dozen of his fellow travelers had not diminished the gleam in his eyes nor weakened the set of his shoulders. It was a painting that told of another time. What would the man say, if he could speak? “Let’s get you back home,” she said. “You’ve been very patient.” She turned the painting over on the work table, which was really just one of the old oversized doors from the back of the building balanced on a pair of smaller folding tables. She was so engrossed in reading the gallery and exhibition labels on the back of the painting that she didn’t notice Cooper step into the workroom. “Frau Klein? Can you speed this along, please?” He stood in the half-open door, rolling the sleeve of his uniform down his arm. “The new hire will be here soon. Let’s meet up in my office.” Captain Henry Cooper was her immediate superior—she his translator and assistant, he an architect assigned to safeguard Germany’s damaged monuments and restitute its stolen art for the Monuments Men unit Anna had fallen into a job with. It was no small task, for sure, and one made all the more interesting by Cooper’s penchant for ignoring the military’s protocols. “I’m almost done here.” She turned back to her work, adjusting the table lamp to get a better look at the hodgepodge of stamps, labels, and numbers that told the painting’s story. Anna knew by now the familiar stencils of the ERR, the Einsatzstab Reichsleiter Rosenberg, Hitler’s ruthless art thieving unit. She made a note of the markings on the condition report part of the long and repetitive intake form, following the established protocol. This canvas, an oil painting of a seated man looking over his left shoulder, likely belonged to the same collector as the dozens of others she had catalogued over the last few days. The Nazi cataloging stamps on the back told that it had been taken from a Jewish family in Frankfurt. Thanks to meticulous Nazi record keeping, the Americans had already made good progress on connecting the paintings with their rightful owners. The only problem, and it was a big one, was finding those owners, if they were even still alive. Of all the Jewish collectors whose paintings they had identified, the Americans had not found a single one yet. For more information, news and updates, please see the author’s website. You can also keep up with her on Facebook and Twitter.